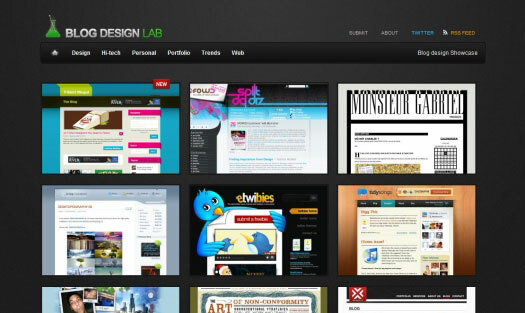 Design galleries are a go-to source of inspiration for many web and graphic designers. While there are no shortage of gallery sites out there, a number of new galleries have been launched this year that stand out in some way or have proven to be useful for a specific type of design inspiration. In this post, we’ll feature 20 new galleries that may provide just the inspiration you have been looking for. 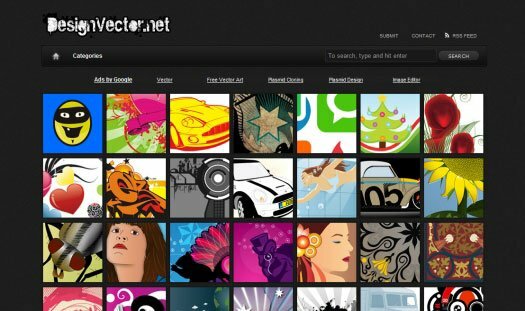 The Design Inspiration is a unique gallery that showcases websites, logos, photos, patterns and more. Each type of inspiration is separated for easier browsing. The site has already become very popular, and if you browse through the archives you will find plenty of inspiration. 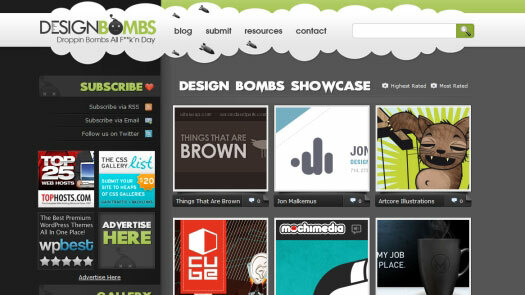 Design Bombs is a gallery created and maintained by Soh Tanaka. 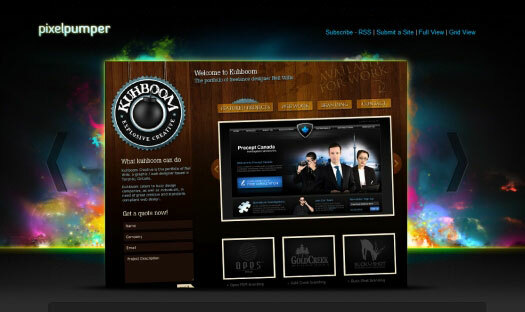 The focus of Design Bombs is to showcase the highest quality web designs, rather than trying to showcase a high quantity. The archives can be browsed by category or color. siteInspire is a great place to find websites that are not the same ones that you will find at every other gallery. The archives can be browsed by style, type, or theme. Sites with minimal designs and clean layouts tend to be featured quite frequently at siteInspire. 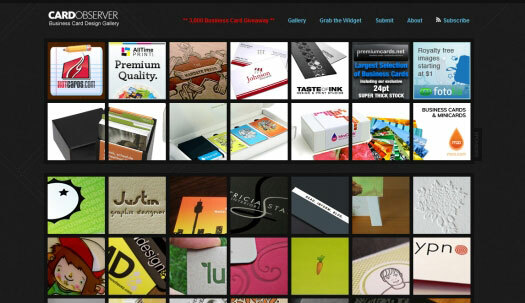 Card Observer is a gallery of well-designed business cards that is run by Henry Jones of Web Design Ledger. If you’re looking for inspiration for your own business card design or looking for examples of unique business cards, Card Observer is the resource for you. 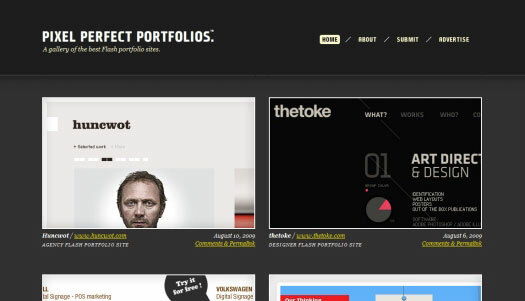 Pixel Perfect Portfolios showcases the best Flash portfolio sites. If you are looking for some inspiration when working on your own portfolio site or for any type of Flash-based site, Pixel Perfect Portfolios is a good source. 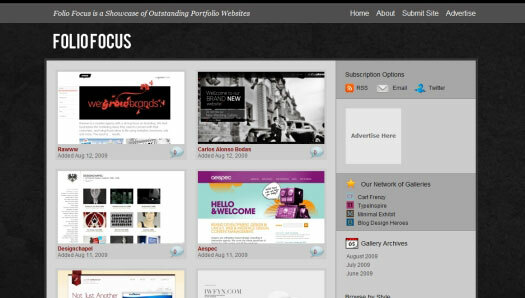 Folio Focus is my own gallery for showcasing exemplary portfolio sites. 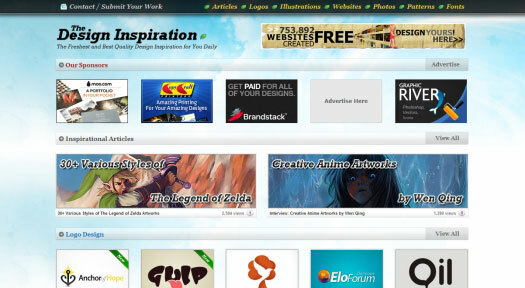 It includes portfolio sites from designers, developers, illustrators, photographers, and more. 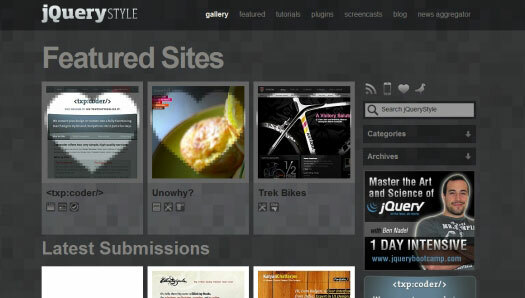 jQuery Style features sites that use jQuery in one way or another. It is a unique and interesting gallery that can help to spark your own creativity and to show what can be done with jQuery. 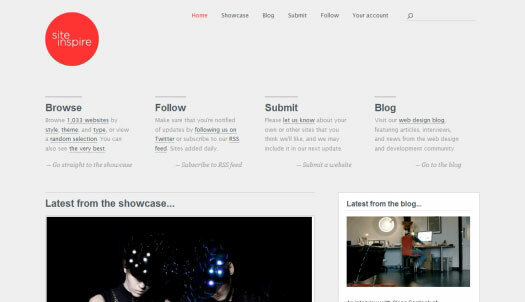 Footer Fetish is a very new gallery from OnWired that showcases excellent website footers. Many blog posts have been written about footers and providing inspiration of this type, but now there is a site specifically dedicated to it. 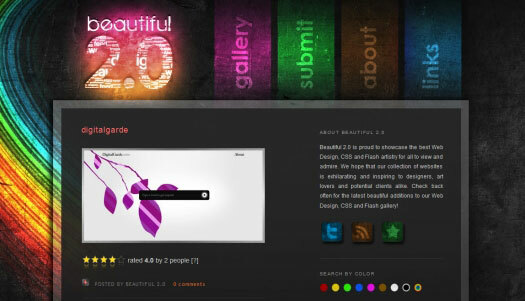 MixCSS is a project of Chris Wallace that uses his Gallery Theme for WordPress. The archives of MixCSS can be browsed by category or tags. 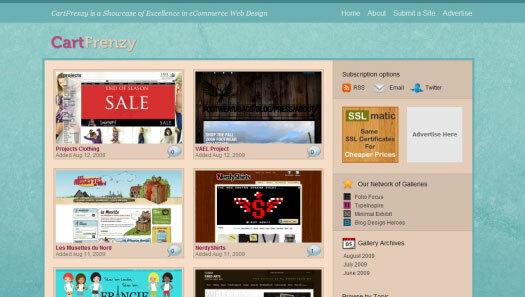 CartFrenzy is a gallery that I launched to showcase the best e-commerce websites. The archives can be browsed by the type/category of site. 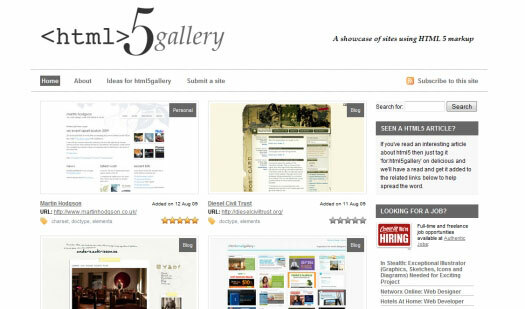 HTML5 Gallery exists for the purpose of showcasing websites that are using HTML5 markup. Each submission includes "notes" that in many cases will give a little bit of info about how the site is using HTML5. Pixel Pumper looks and functions a little bit differently than the typical gallery. You can browse through the sites in a large slider, or choose a more typical grid view. 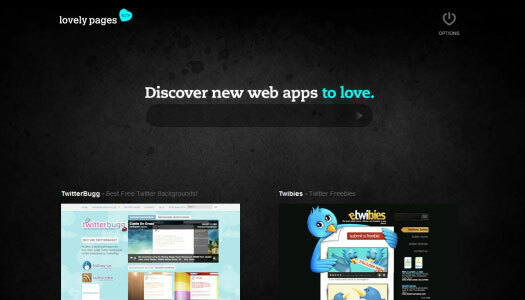 Lovely Pages is a gallery of web apps and services. The site uses a nice design that avoids clutter. 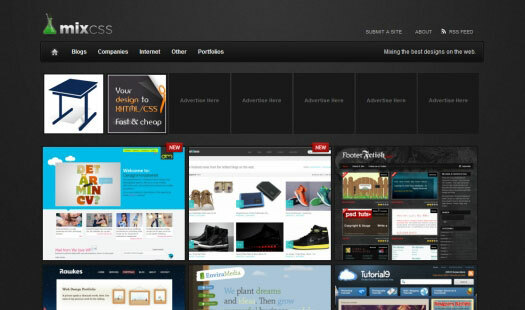 Beautiful 2.0 showcases all kinds of websites with large screenshots. The archives can be browsed by month or by color. 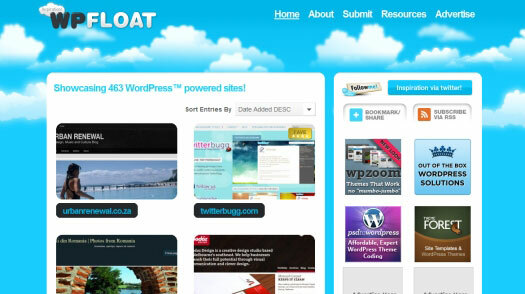 WP Float is a new gallery that showcases WordPress-powered websites and blogs. As WordPress is an extremely popular CMS and other sites like We Love WP have had success, WP Float should prove to be a valuable resource for WordPress designers. 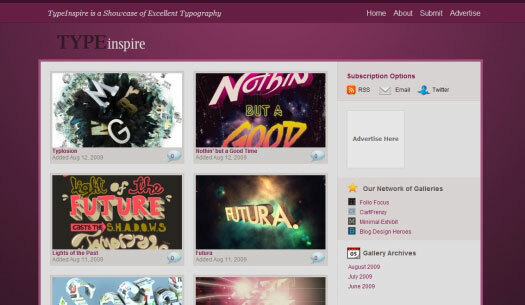 TypeInspire is my gallery that showcases inspiration typography and text effects in various forms. This includes posters, brochures, websites, logos and more. CSS Luxury is a new gallery that publishes a high quantity of featured sites. 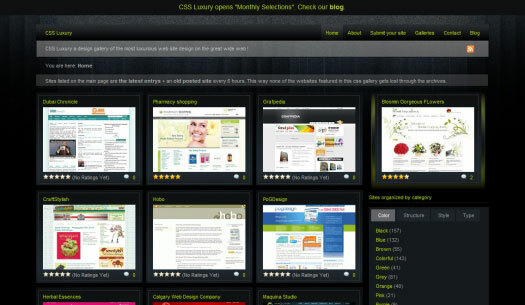 If you’re looking for a place that has a lot of examples, check out CSS Luxury. The archives can be browsed by color, structure, style, or type. Blog Design Lab is a gallery that focuses on blogs of all kinds. If you are designing blog themes for yourself or for clients, Blog Design Lab can prove to be an excellent source of inspiration. 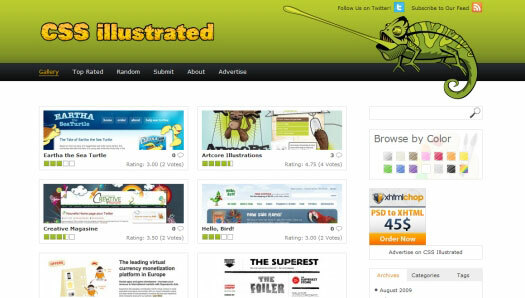 CSS Illustrated features sites with inspiration use of illustration. This design trend can be found in a lot of places, but CSS Illustrated is the only gallery (that I know of) that focuses exclusively on this style of site. DesignVector showcases vectors from various designers. The site is still new, so there are less than 100 items in the archives, but hopefully it will continue to be a great source of vector inspiration. What are some of your favorite new galleries? Do you frequently visit any of the galleries listed here? Are there others that have been launched in 2009 that you think are worthy or being mentioned? Steven Snell is a web designer and freelance blogger. You can find more of his work at DesignM.ag or follow him on Twitter.